The Hanoitimes� – With the high growth potential, coworking space is promising to bring tremendous utility not only for the users but also a ‘piece of cake’ which is attractive for both foreign and domestic investors. Major international coworking space players have entered Vietnam’s market, which has developed strongly over the past year driven by the country’s large millennial population. The US-based coworking space firm WeWork this week announced that it will start putting into service its first coworking space office in Vietnam early next month. According to Turochas “T” Fuad, managing director for Southeast Asia at WeWork, the firm’s first coworking space in E-Town Central Building in Ho Chi Minh City’s District 4, which has four stories and can accommodate 1,000 people, is the firm’s largest space in the region. WeWork boasts the advantage of completing construction within a short timeframe, thus helping reduce investment costs and making rental fees more competitive and flexible, though office rental fees in the city remain high compared with the rest of the region, except for Singapore, Fuad said, adding that WeWork hopes to roll out the second coworking space office in Vietnam next year. Reports by real estate services provider Savills Vietnam showed that 43 coworking spaces have been opened in Hanoi and 15 in Ho Chi Minh City since early 2014. Besides local names like Toong, Up, and Hatch, the growing market sees foreign operators like Regus (UK), Hive (Hong Kong), CEO Suite (South Korea) and Kloud (Singapore). Experts said that the office supply in big cities such as Hanoi and Ho Chi Minh is becoming scarce, giving a great opportunity for the coworking space business to grow in Vietnam. According to CBRE’s reports, the number and area of coworking sites in Vietnam have been increasing dramatically. It is estimated that the local coworking property market will surge from 30,000 square meters by the end of the first quarter this year to over 90,000 square meters by the year-end. Currently, the coworking space market in Vietnam accounts for about 3 percent of the total office rental market, which is still lower than the ratio of 5 percent seen in other regional markets. It is expected the ratio will reach 10-15 percent over the next five years. With the high growth potential, this new model is promising to bring tremendous utility not only for the users but also a ‘piece of cake’ which is attractive for both foreign and domestic investors. Besides WeWork, Ucommune, JustCo and the Hive are also planning to penetrate the Vietnamese market in the near future. 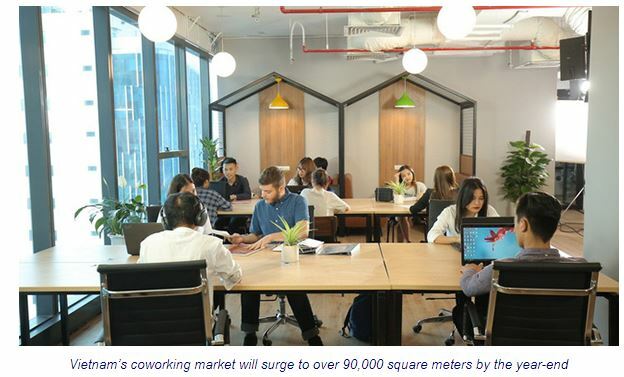 Nguyen Hoai An, director of Consultancy Services at CBRE Vietnam, forecast that as millennials account for 91 percent of clients in Vietnam’s coworking spaces, much higher than the global average rate of 67 percent, more firms are bound to join the market to meet the demand. According to Bui Trung Kien, deputy director of Commercial Leasing of Savills Hanoi, the entry of a giant like WeWork will certainly have an impact on the coworking property market in Vietnam. However, he added that each firm has its own competitive advantages and the presence of international firms would make the market more dynamic and professional. Every coworking space is different in its business model and its target customers, Kien explained, adding there are units geared towards young entrepreneurs, startups, and freelancers, while some are aimed at small- and medium-sized enterprises or foreign corporations looking to rent office space in Vietnam, adding that the co-working market in Vietnam is competitive and developing in a healthy way. Taking a lesson from the giants, local co-working spaces, which mostly serve startups and freelancers, could make their business models more flexible and attract potential corporate clients, Kien said. Echoing Kien, a representative of well-known local coworking space firm Toong said the company was “happy to welcome foreign operators”, adding that the market is big enough for many more players.